Enjoy the highlands, the jungle and the coast of Ecuador while studying Spanish! Located at 2 800 meter above sea level, Ecuador’s capital boasts bustling indigenous markets and colonial architecture. It’s a beautiful city with lots to offer for all ages and tastes. 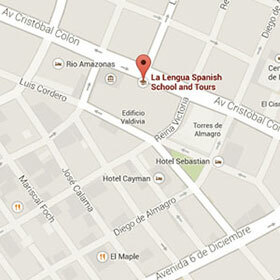 Our school is located in the tourist center close to the bars, restaurants and internet cafes. Baños is situated in the Tungurahua Province, about 169 km South of Quito, near the Tungurahua volcano (5 016 m above sea level). This lovely town lies in a beautiful valley at 1 800 m, surrounded by waterfalls and hot springs. Live in the heart of the jungle, a unique natural site while improving your Spanish with help of experienced teachers. Suchipakari is situated approx. one hour away from Tena. Puerto López is an authentic fishing village located in the Machalilla National Park, on the Pacific Ocean coast. From there you can make different excursions, such as the Isla de la Plata. This village is famous for its delicious local culinary specialties which should not be missed on any account. 09:00 – 12:00, 3 hours individual Spanish classes. 14:00 – 17:00 visit to the historic center of Quito by local bus with a Spanish teacher. In 1978 UNESCO declared Quito’s colonial center as one of the world’s cultural heritage sites. Two meals and accommodation in an Ecuadorian host family. 08:30 – 12:30, 4 hours Spanish classes. Two meals and accommodation in a host family. 08:30 – 12:30, 4 hours Spanish classes, afternoon free time. 07:30 – 16:00 excursion to the indigenous market of Saquisilí with your Spanish teacher. This market is for the inhabitants of remote indigenous villages who flood into town to buy and sell everything from bananas and herbal remedies to strings and piglets. Many travelers rate this market as the best they’ve seen in Ecuador. It’s a two hour drive, passing the Cotopaxi volcano. Once arrived in Saquisilí you first visit the animal market and then make your way through the rest of the market. Lunch (not included in the price) and drive back to Quito. Sunday optional: Tours La Lengua (see above). Morning bus to Baños with your teacher. Accommodation at the “Hostal Llanovientos”, single room with private bath. Afternoon 3 hours Spanish classes. Breakfast, 09:00 – 12:00, 3 hours Spanish classes. Lunch at a local restaurant, in the afternoon hike to the viewpoint. Breakfast, 09:00 – 12:00, 3 hours Spanish classes, in the afternoon bike on the “Ruta de las Cascadas”. Lunch at a local restaurant and accommodation at the “Hostal Llanovientos”, single room with private bath. Lunch at a local restaurant, in the afternoon visit to the zoological Garden and accommodation at the “Hostal Llanovientos”, single room with private bath. Lunch at a local restaurant. Return to Quito by bus and accommodation at the host family. Saturday Breakfast, free time and dinner & accommodation in the host family. Preparation of the Natural Chocolate. Distribution of rubber boots, walk through the jungle , observing the view the RESERVE offers. Enjoy swinging on vines like Tarzan, explanation of medicinal plants like the blood of drago, the ortiga, the ayahuasca, Ginger, the guayusa, hierba luisa, etc. Take pictures next to the Gigantic tree of the Amazon: “The Great Ceibo”, birdwatching. Escalation to the Natural View Point of the Napo River. 08:00 Distribution of rubber boots. Walk to the cascade, meanwhile observing the indigenous communities on route. Swim along the cascade. 08:00 30 minutes walk to the Napo River, boarding on the motor canoe. Distribution of life vests. Navigation to the Museum of Amazonic Traps, observation of wildlife: alligators, boa constrictor, boa constrictor,parrots, tucans, jaguars, lizards, frogs, monkey, among others. Afterwards continue to the Kichwa Community , participate in the typical dance, elaboration of the chicha from the cassava, “typical drink” and shopping at handicraft shops. Return to the Lodge. Box Lunch – Return to the Lodge. Dinner, night walk in the jungle. Saturday in Quito, two meals and accommodation in a host family. Breakfast and dinner at your host family, free time in Quito. Optional: Every weekend our school offers different kind of tours to our students (Volcano trekking, Thermal Baths, lagoons etc.). To find out, which tour we offer on this particular weekend and about the prices, please contact the school in Quito beforehand. Night bus to Puerto López. Arrival in Puerto López, breakfast, relax, 3 hours Spanish course in the afternoon, accommodation “Hosteria Itapoa”. Breakfast, Spanish course from 09:00 – 12:00, afternoon excursion with your teacher to Agua Blanca. This little village has an archaeological museum explaining the excavation of the Manta site that is about a half-hour walk away which can be visited too. Breakfast, Spanish course from 09:00 – 12:00, afternoon excursion to the “Los Frailes” black volcanic sandy beach. Breakfast, excursion to Montañita with your Spanish teacher. Montañita is famous for its hippie and surf community and its bamboo architecture. Here you can have a go at surfing, buy some handmade jewelry or just have a swim and walk at the beach. Important: This price is based on one student. If you wish to study in a small group of two or more students with only one teacher, you will get a discount of USD 150 per student. However, if you would like to travel together, but each one with your own teacher, the price remains the same. We also offer trips to the Galápagos Islands. For further information about dates, prices, boats please don’t hesitate to contact us!